Being just one of just two women who’ve had regular releases during the first 19 months of rock’s existence means Annie Laurie faces more pressure than most rock acts to come up with viable records so that the female perspective isn’t thoroughly discounted altogether. That’s hardly a fair proposition for somebody who simply needs another big seller to keep her career moving forward. Yet Laurie’s output thus far has been nothing if not consistent and on the whole it’s shaping up to be slightly better than average rock ‘n’ roll for the era in question. Much of it has shown even more promise than the results would indicate as slight missteps have pulled them back down and those flaws should be easy enough to correct, so now the question becomes when will she start to realize that vast potential and take the next step and really start moving to the forefront of the rock movement? Based on this record the answer, it would seem, is now. As always when analyzing Annie Laurie’s musical progress we’re also analyzing Paul Gayten’s still developing arranging skills. The two are interlocked with one another and for the most part, for years to come at least, they will be joined at the hip in their musical endeavors. That’s obviously not a bad person to tie your fate in with if you’re Annie Laurie. Gayten’s skills as a songwriter, pianist, producer and arranger are as good as it gets, especially at this juncture of rock’s evolution when few figures on the scene managed to competently cover any two of those roles, let alone all four, and to date Gayten has showcased some excellent ideas and quirky textures in most of the sides he’s been associated with. Yet for all of his high points he’s also been done in at times by selling some of his better instincts short, not going for the jugular so to speak and trying to really set himself apart, and so each time we encounter him we’re always curious as to just how adventurish will he be and will he have the ego and cockiness to see those more cutting edge ideas through? If you brought this record home with high hopes and placed the A-side, Waiting For You, on the turntable first you’d almost certainly throw it out the window and then leap out after it so you could make sure it broke into enough pieces to be rendered unplayable should the garbage man happen to pick it out of the trash and take it home for a listen. That side of the record is an out and out travesty. An offense to humanity featuring an arrangement that is sickeningly pop with an elegiac trumpet intro, subtle strings and Gayten playing dainty supper club piano as if his fingers were made of porcelain, all of which puts a damper on Laurie’s occasionally soulful vocal yearning until you wonder what kind of joke they’re pulling on you. Ahh, but of course it’s no joke, as the late 1940’s rock scene was infested with talented artists who had delusions of grandeur and since Laurie and Gayten had already tasted mild success crossing into pop just before rock broke wide open in late summer 1947, you can understand – if not excuse – their aspirations. But it wouldn’t be pop music that would define either one and smartly they kept the fires burning in the rock cauldron as well and that’s where Gayten’s arranging skills – not beholden to the mannered dross of the pop world – are given full flower in a style he was far more suited for. Here, while not overly ambitious or radical in its conception, Gayten delivers an understated gem highlighted by moaning horns playing a descending riff throughout, giving added emotional gravitas to the lyrics which delivers a similar sentiment. As for Laurie’s approach to all this, well it’s not called Annie’s Blues for nothing and the overall mood is mostly somber as she recounts her prolonged split from her man, apparently not brought about by any rift between them as much as some unspecified circumstances to keep us guessing. Whether he went away to work, or she went back to her family for some emergency, the two of them have been apart “six months, three weeks and two days” and her mournful tone when thinking about the good loving she’s been without suddenly turns into expectant joy at the end of each refrain as the horns ramp up their support to match her anticipation. There’s so many potential subtexts to this that delving into interpreting the true story requires the investigative skills of Easy Rawlins or Lew Archer, but it’s fun to try and get a handle on it all the same. Yet Annie herself doesn’t seem like she’s been exactly faithful herself, or at least not by choice, otherwise why would she be claiming “I haven’t had no real good lovin baby since you’ve been gone”. Parsing that line you naturally focus on the “real good” part of it, meaning she may have had satisfactory lovin’ without him around but now is craving the type of loving that only he can provide her. This is getting juicy in other words. Now it has to be said, so nobody thinks I’m leading them on, that nothing much comes of it in terms of major plot twists or surprising endings. Basically the entire song is just Laurie ruminating to herself as she’s on the train headed to wherever her man may be. But that’s plenty of intrigue to sustain us all the way through because it offers us the opportunity to read between the lines and come up with our own scenarios, all of which may be plausible or they may all be purely unfounded conjecture. Yet it doesn’t matter which it is because music exists, at least in part, for individual interpretation. The danger in that is projecting your OWN views onto the song as if your conclusions were definitive, inarguable points of fact. I suppose we’re all guilty of this at some point. Bob Dylan’s 1960’s work is the best example perhaps, as his followers (and particularly erudite music critics seeking to validate their own opinions by advancing their own lyrical interpretations as if they were endorsed by his Bobness) read all sorts of things into the byzantine lyrics, thereby allowing Dylan to profit critically from it in ways that he wouldn’t have if the lyrics had been more cut and dried. So I’m not in any way suggesting that any of these thematic options are precisely what Annie’s Blues means or should come to represent, but rather these are some of the many possibilities that are lurking under the surface. We’re curious creatures by nature after all and so when a plot synopsis is given, but with a few important details left out, such as the MOTIVATION for the rest of the plot, we’d like to know what happened to set this tale into motion. Something caused the characters in this song to be apart and what that something is – or may be – factors into our appreciation of it. We don’t all have to even agree what the details are to be able to see the conflict inherent in her thoughts. We never DO find out, which of course is frustrating, but it doesn’t detract from the song so much as add a little something to it. 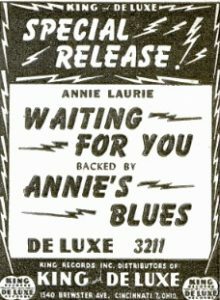 Assuming you’ve been reading along one review at a time in order – as is heartily recommended for more reasons than just my ego – you’ll remember that early on when meeting Annie Laurie, a singer who already had a national hit on her résumé and who clearly possessed a strong voice, her most notable shortcoming was an inescapable disconnect between her and the sentiments she was delivering in a song like One Sweet Letter From You. That song sounded very nice, but like Annie’s Blues there was more going on in the text than we the listener were privy to. The two songs in fact share many of the same ambiguous qualities, as “Letter” found her at home wishing for some correspondence from a man from her orbit who, for one reason or another that’s never stated, has been taken from her. Annie’s Blues could be the sequel to that, and in fact may have been for all we know, as here’s she’s on her way to meet “him” (whether the same him or a stand-in, it matters not). The lack of specifics regarding the particulars of their separation – the where, the when and most importantly the why – are lacking in both songs. Since we found fault with it in One Sweet Letter From You and downgraded accordingly you would think we’d repeat that complaint here, maybe even be more harsh with her now that a full 14 months have passed, as we lustily complained she was repeating the same mistakes and wondering if she’d EVER learn her lesson. But obviously we’re not doing that because something notable HAS changed in all of this which should be evident to anyone listening closely to both. While it is true that we don’t have a clear understanding of what transpired between the protagonists in either song, the difference is in THIS song Annie Laurie clearly DOES know and is merely keeping it to herself. I know, I know, that seems ludicrous to assert in a review when nothing about the one piece of hard evidence regarding the plot that we DO possess (IE. the lyrics) verifies this. I also know what I just wrote about the dangers of projecting your own views into a song, how that is nothing more than risky conjecture and undermines the credibility of the impressions you draw from that. I’m not stating that THIS is what happened and then laying out what “this” is. I have no idea whether they fought and he left or if she kicked him out, or whether he ran off with somebody else and they reconciled over the phone or perhaps through “one sweet letter” he sent her. I don’t know if he went off to take a job elsewhere and was sending his pay back home to her, or whether he robbed someone of THEIR pay and went on the lam or was languishing in some rotten jail. What’s more, I don’t much care at this point. What I do care about is hearing some evidence that Laurie herself knows what happened and that knowledge is conveyed in her singing. Not by offering US any obvious clues, hints, or out and out facts, but just a sense of awareness of the deeper meanings and explanations that lyrics like these require. Let’s call it a level of authenticity in her delivery to connect with the audience. If Laurie’s at all unsure of what she’s singing about, or if she treats them merely as words on a lyric sheet and focuses more on the melody she sings them with rather than the emotion laying beneath it’s not going to work. No matter how well everything else falls in place her job is to inhabit the song as if it were her own life’s story and she does just that here. It’s obvious that Gayten and Laurie are on the same page on this, his arrangement highlighting her vocals or her vocal choices gently guiding his arrangement. You aren’t sure who is leading whom and that makes it all the more effective. The slow pace is seductive and she plays into that rather than struggles with it. There’s almost the sense that the meandering quality of the music is allowing her to sift through her tangled emotions, figuring out what she wants to say and how she wants to say it and proceed with the appropriate emphasis to make her point. She doesn’t need to provide us with subtitles because she’s not even aware of our eavesdropping. She’s recounting all of this in her own mind having lived it these last few months and now she herself is about to learn the resolution of the story as it plays out in real time when the train comes to a stop and the anticipation is on the verge of overwhelming her senses. Her wordless cries near the end sound as if come from deep within and aren’t merely melodic embellishments as much as they are emotional releases. In the past Laurie let her impressive voice overshadow the sentiments which she never fully inhabited and as a result she was more often than not merely content to ride the melody as a passenger. But here she manipulates that melody like a seasoned pro… the technical skills finally catching up to her natural attributes, something most evident just when the song almost slows to a crawl and she revs up her delivery enough to impart a healthy dose of urgency about her intent when she sees him and what she expects out of him when they meet. That subtle move lets us see that she’s in control of this relationship and we don’t need to know any more than that to get a sense of her mindset as they get closer to being together. The results could wind up being blissful, lusty, scornful or spiteful, or a mix of all of those and more, but we’re confident after hearing her expound on the subject – even without a single detail to shine some light on the circumstances surrounding them – that Annie Laurie is in the driver’s seat. 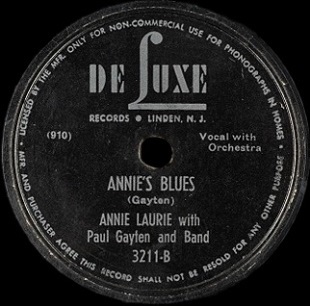 Leave a reply on "Annie Laurie: “Annie’s Blues”"